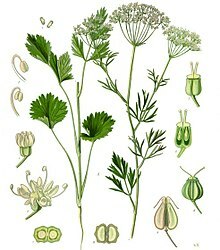 Anise (Pimpinella anisum), also anís and aniseed is a flowering plant in the family Apiaceae native to the eastern Mediterranean region and southwest Asia known for its flavor that resembles liquorice, fennel, and tarragon. Anise was used to make the spiced wine, claret, in the Middle Ages. This page was last changed on 10 March 2013, at 11:49.